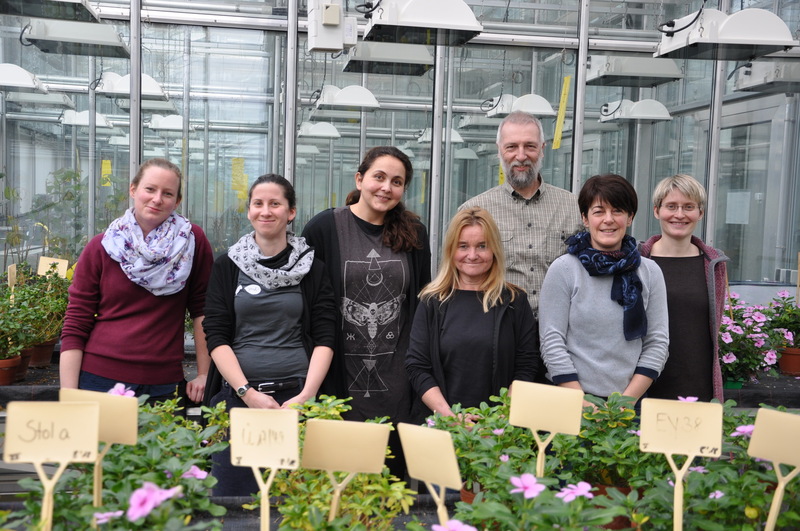 Our lab is part of the Institute for Plant Protection in Fruit Crops and Viticulture of JKI, the Federal Research Centre for Cultivated Plants in Germany. JKI advises the federal government in all relevant issues related to plant protection in fruit crops and viticulture. Our institute conducts research on the causal agents and control of diseases and pests of fruit crops and grapevine. A broad spectrum of state-of-the-art methods is applied to studies on damaging microorganisms, insects, and other pests. Utilizing a combination of laboratory, greenhouse and field research, we strive to develop innovative and sustainable solutions both for integrated and organic fruit production and viticulture. Within the institute, our lab is dedicated to the epidemiology of insect transmissible grapevine diseases, combining field work and lab studies. We are particularly interested in the study of phytoplasma diseases of grapevine and their pathosystems in order to collect information required for risk assessment and disease management strategies. Bois noir (BN) caused by Candidatus Phytoplasma solani is widespread in German viticulture and a main focus of our work. BN is embedded in an intricate pathosystem consisting of pathogen strains with a high genetic variability, different vector species mainly of the planthopper family Cixiidae and a wide variety of wild host plants. The specific associations of pathogen strains and vector populations or host races to various plant hosts span a complex network of interactions which is affected by geographical, environmental and viticultural factors. Our work is dedicated to the deciphering of the BN pathosystem in order to identify the drivers of infection pressure and to improve management strategies. The most important phytoplasma disease of grapevine, Flavescence dorée (FD), is still absent from the German winegrowing regions. To gather the basic information for the assessment of risks posed by wild host plants of FD related phytoplasmas and their insect vectors we are studying the epidemic cycles of those phytoplasmas and their relationship with grapevine diseases. An important element is the assessment of the epidemic potential of those strains in combination with the FD vector. This work is carried out in close and long going cooperation with the team of INRA Bordeaux. Lang, F., Kölber, M., Elek, R., Kappel, Y., Kröhner, D., Johannesen, J., & Maixner, M. (2016). Potential role of Reptalus panzeri as a vector of Bois noir in Germany. Mitteilungen Klosterneuburg, 66(1), 26-27. Mori, N., Pavan, F., & Maixner, M. (2014). Control of Hyalesthes obsoletus nymphs based on chemical weeding and insecticides applied on Urtica dioica. Vitis, 53(2), 103-109. Maixner, M., & Johannesen, J. (2014). Optimized monitoring of host populations of the Bois noir vector, Hyalesthes obsoletus, based on flight phenology observations. IOBC-WPRS Bulletin, 105, 151-157. Maixner, M., Albert, A., & Johannesen, J. (2014). Survival relative to new and ancestral host plants, phytoplasma infection, and genetic constitution in host races of a polyphagous insect disease vector. Ecology and Evolution, 4(15), 3082-3092. (https://doi.org/10.1002/ece3.1158). Imo, M., Maixner, M., & Johannesen, J. (2013). Sympatric diversification vs. immigration: deciphering host-plant specialization in a polyphagous insect, the stolbur phytoplasma vector Hyalesthes obsoletus (Cixiidae). Molecular Ecology, 22, 2188-2203.(https://doi.org/10.1111/mec.12237). Maixner, M., & Johannesen, J. (2012). Spatial and Temporal Distribution of the Infection Potential of Stolbur Phytoplasma on a Fallow Vineyard. Proceedings of the 17th Congress of ICVG, Davis, California, USA, October 7-14, 2012., 232-233. Johannesen, J., Foissac, X., Kehrli, P., & Maixner, M. (2012). Impact of vector dispersal and host-plant fidelity on the dissemination of an emerging plant pathogen. PLoS One, 7, e51809. (https://doi.org/10.1371/journal.pone.0051809).